There’s little to criticize with Mates of State. They’ve been making successful indie pop electronica long enough to know their genre and their audience. Releasing an EP because nobody listens to full length albums feels out of touch after the back to front enjoyability of their previous release Mountaintops. Singer/drummer Jason Hammel thinks we only want the hits, so that’s what we’re getting in You’re Going to Make It, five instant hits. “I Want to Run” continues the high-energy emotion. In addition to harmonizing with one another, Mates of State successfully layer Kori’s voice over her own. Again we have the reminder that it’s better to be creative together rather than apart. Where the song could be too sweet (“you’re all that I’ve got when it’s dark”), Mates of State save it by integrating all the elements in a nuanced manner. There are hints of 80s New Wave, the reliance on electronic components that really throttle the song until it gives the listener everything. “Gonna Get It” starts out slow and then ends strong enough to work by itself. 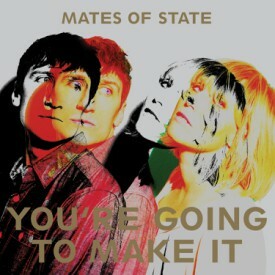 With You’re Going to Make It, Mates of States make good on their promise to release only the hits.